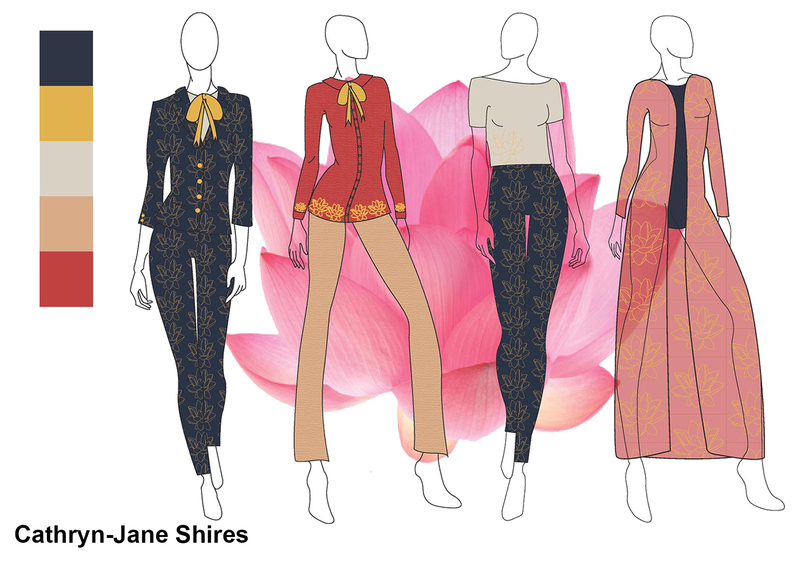 Singapore Airlines has teamed up with The Manchester College to launch a design competition with its fashion department as part of its ongoing investment in Manchester. 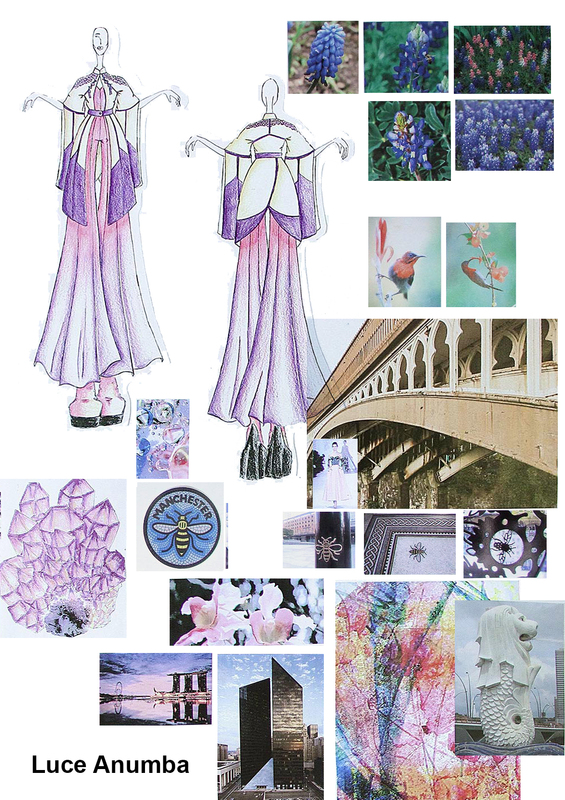 The airline has challenged 28 fashion students at the college to create a bespoke garment that celebrates the launch of new non-stop routes to Houston and Singapore launching at the end of October. The students have been challenged to take inspiration from the cultures of Houston, Singapore and Manchester as well as Singapore Airlines. They were asked to design a unique garment that utilised as many as possible of these cultures to represent the destinations and Manchester. The 28 designs have been whittled down to five by a panel of judges from Singapore Airlines, Manchester Airport and The Manchester College. The top five are now busy bringing their sketches to life. Luce is 19 years old is of Italian descent and lives in Moss Side, Manchester. She is studying Level 3 Fashion Design at The Manchester College’s Northenden Campus. The structure of the design is directly inspired by Manchester bridges, the sculpture of the Singaporean national simple (the Merlion) and the shapes within the wings of the Manchester bee. The contrasting surface shapes come from aspects of Houston’s architecture, Pennzoil Place. The colour palette also references the Singaporean Sunbird and Houston’s Bluebonnet. Laruen is 17 years old from Swinton, Greater Manchester and is studying Level 3 Fashion Design at The Manchester College’s Northenden Campus. This design is a two-piece outfit consisting of jacket and trousers. Singapore flowers inspire the flare on the trousers and jacket sleeves. The blue and gold within the trousers and jacket references Singapore Airlines identity. 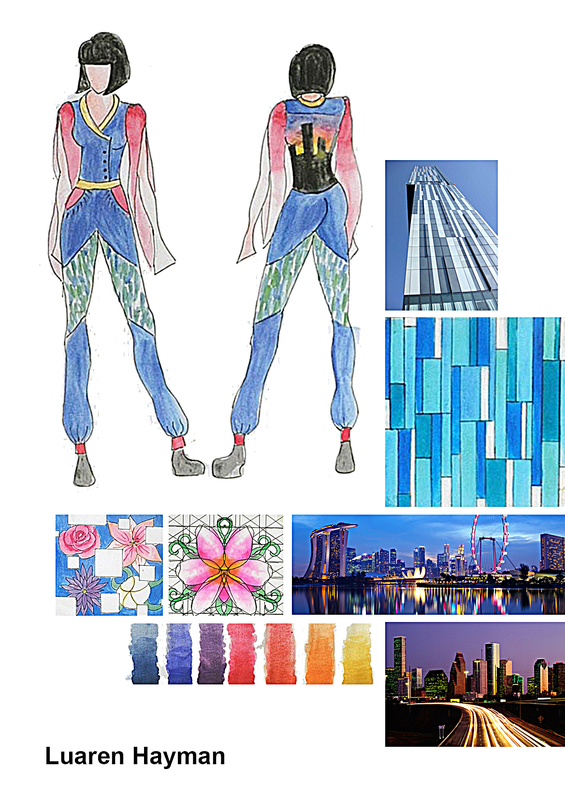 The panel within the trousers is based on Manchester’s Hilton Hotel and the night time skyline of Houston and Singapore in general inspires the colour palette. Cathryn-Jane is 18 years old from Stockport, Greater Manchester and is studying Level 3 Fashion Design at The Manchester College’s Northenden Campus. This capsule collection is based on an interpretation of the brief that explores international travel and businesswoman style with six piece mix and match sophistication. 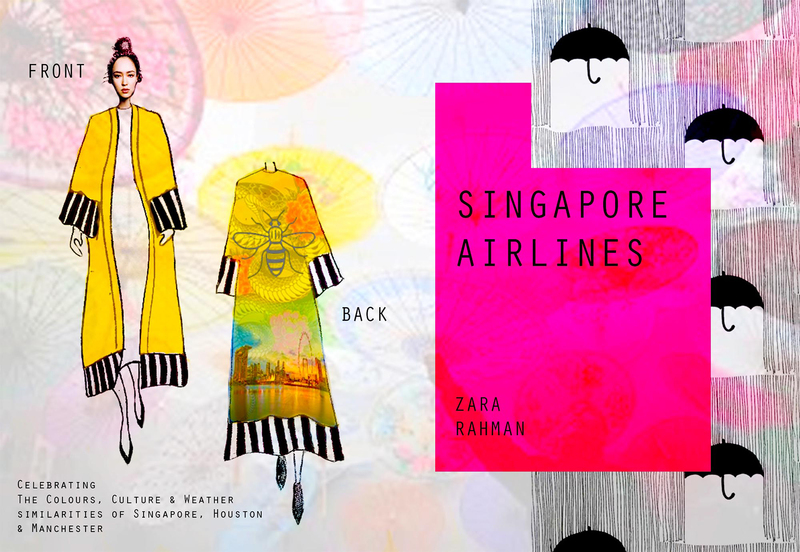 The designs reference the mixture of Indian, Chinese and Malaysian culture that combines in Singapore’s social makeup. The lotus flower features in the print on each of the items. Elizabeth is 18 years old from Fairfield, Manchester and is studying Level 3 Fashion Design at The Manchester College’s Openshaw Campus. 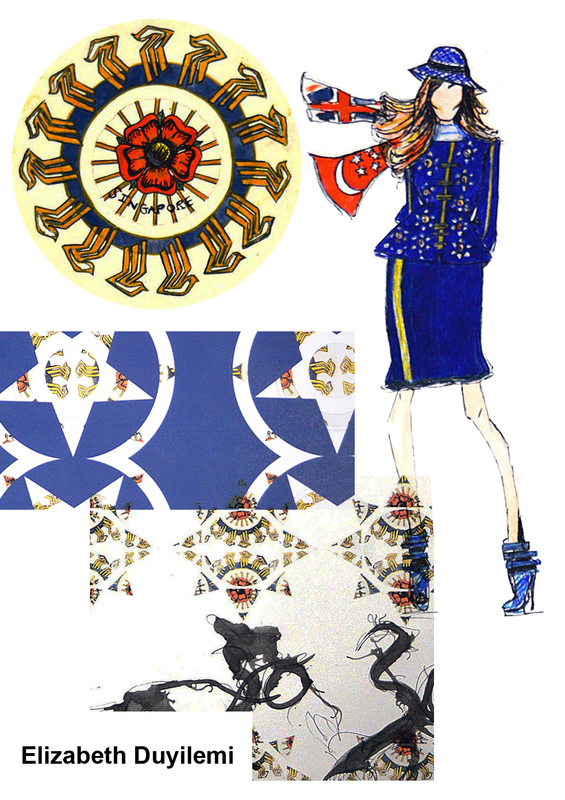 The outfit consists of a peplum jacket and skirt in the blue of Singapore Airlines. The print on the jacket is based on oriental half drop pattern with the motif made by combining the Singapore Airlines gold logo, the rose of Lancashire and the Manchester wheel. The scarf comprise the Union Jack and flag of Singapore. Zara is 24 years old from Salford, Greater Manchester and is studying Level 5 Fashion Design at The Manchester College’s Shena Simon Campus. The design uses a silk like finish reminiscent of far eastern traditional clothing. A placement print on the back combines symbolism and architectural features associated with Singapore, Houston and Manchester. Singapore Airlines will fly five times weekly to Houston from 30 October and direct to Singapore from 31 October. For more information visit singaporeair.com.